Typically, when presented with a “buy-one-get-one” coupon, customers expect to pay the original price for one item and then get the second one free. But one Burger King customer claims the fast food chain actually increases the price on the first sandwich so you’re not truly getting two for the price of one. In a class-action lawsuit, filed last week in a federal court in Maryland, the customer accuses Burger King of deceiving consumers with its national buy-one-get-one coupon for its Croissan’wich breakfast sandwich. According to the lawsuit, when offering the coupon — which entitles customers to a free Criossan’wich with the purchase of one at its standard price — Burger King increased the price of the first sandwich. When a customer uses Burger King’s BOGO coupon, they are unknowingly forced to pay an inflated price for the first Criossan’wich they purchase in order to receive the second Croissan’wich for “free,” the suit states. “Burger King’s nationwide BOGO scheme is deceptive to reasonable consumers who expect that, when using a BOGO coupon at any retail store or restaurant, absent any exclusions or other terms and conditions, they will pay the same regular price for two identical Croissan’wiches as they would pay to purchase a single Croissan’wich,” the suit claims. 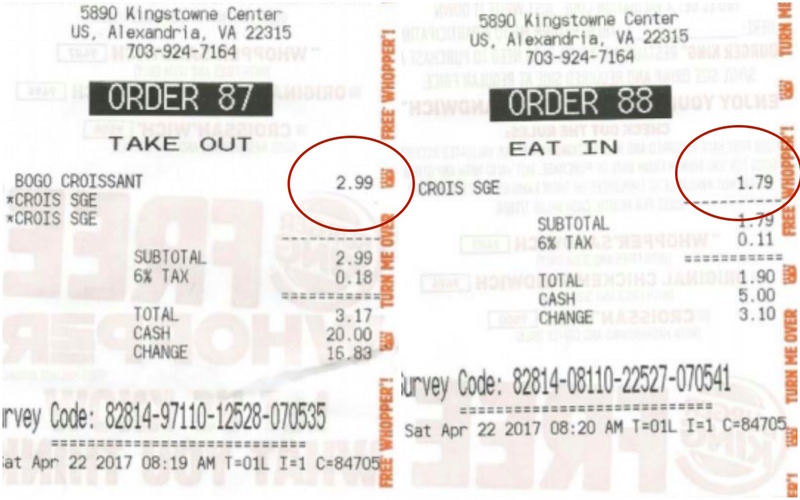 The Maryland woman who filed the suit claims she experienced Burger King’s deceptive coupon practice first-hand at several locations in Maryland, Virginia, and the District of Columbia. 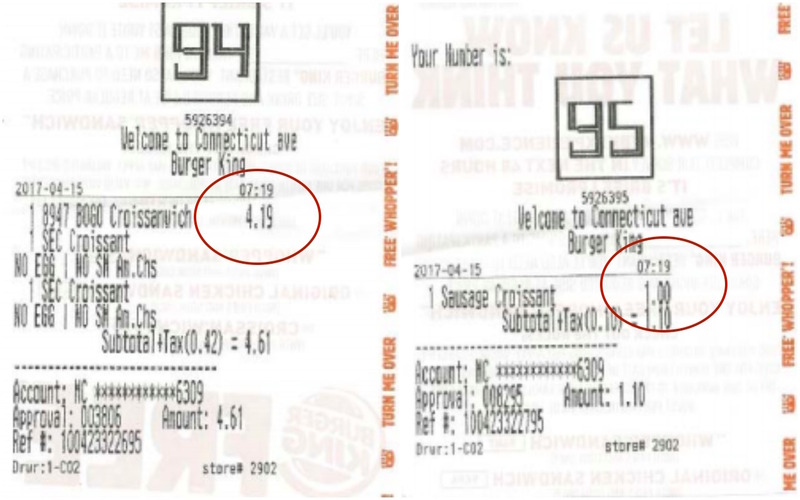 In one instance in March 2017, the woman says she was charged $1.03 more for her Croissan’wich when she offered a BOGO coupon than when she purchased the same sandwich without the coupon. In fact, a receipt for the transaction shows the sandwich purchased with the coupon cost $3.19. A few minutes later, she returned to the store and purchased another Croissan’wich without the coupon. This time she was charged $2.16 for the meal. Believing that the Maryland location may have been an outlier, the woman visited two other locations in Virginia and Washington, D.C., the following month. While the price for sandwiches varies by geographic location, the woman says the discrepancies between purchasing a sandwich with the coupon and without continued. 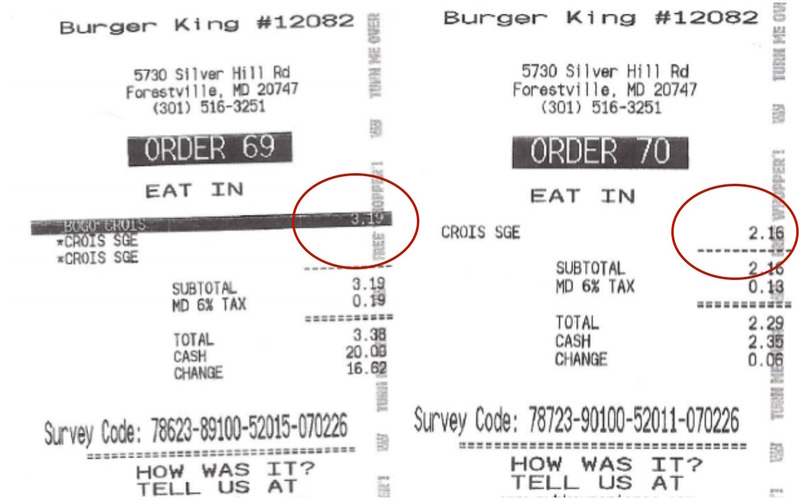 For instance, in Washington, D.C., a receipt shows that the woman paid $3.19 more when she purchased a Croissan’wich with the BOGO coupon versus when she bought the sandwich alone. At the Virginia location, the price difference was more modest, with the woman paying $1.20 more when using the BOGO coupon. The woman then hired a lawyer who sent an investigator to a Florida-area Burger King. The same practice was found to be in place at these locations. 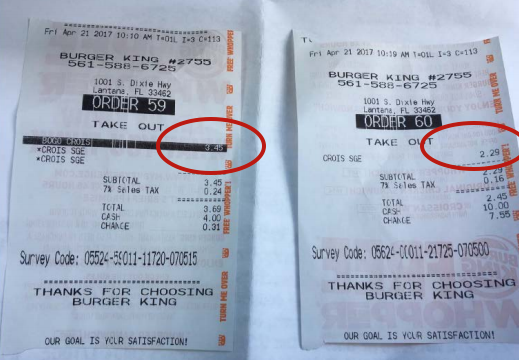 In one case, the customer was charged $3.45 for the first sandwich using a BOGO coupon, and $2.29 for the item when purchasing it alone. After witnessing the consistency of the alleged deceptive practice at several locations, the plaintiff believes that the policy of charging an inflated price on a Croissan’wich when using a BOGO coupon is implemented nationwide and came from Burger King corporate. “Accordingly, Burger King’s nationwide scheme is stealing untold millions of dollars from hard-working Americans,” the suit claims. As a result, the lawsuit seeks damages for customers each time Burger King charged more for the sandwich and an order requiring the fast food chain to stop inflating the price of Croissan’wiches purchased with a BOGO coupon. Consumerist has reached out to Burger King regarding the lawsuit. We will update this post if we hear back.